Crude oil prices ended the year above $50 per barrel (b). 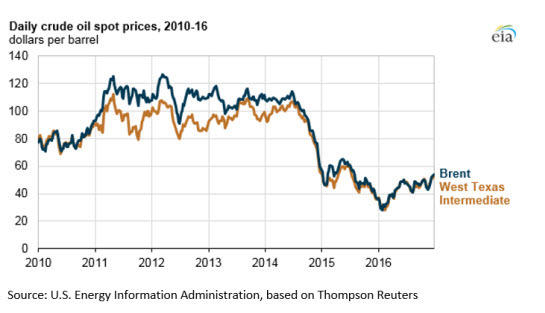 Although the annual average West Texas Intermediate (WTI) crude oil price in 2016 was $43/b—down $5/b from 2015—the WTI price ended 2016 at $53/b, $16/b higher than at the end of 2015. Similarly, Brent ended the year up $17 from the end of 2015, at $54/b, but the 2016 annual average of $44/b was $8 below the 2015 average. Despite robust demand for petroleum products, relatively high production and inventory levels provided downward pressure on crude oil prices throughout most of 2016. However, recent agreements to curb production over the next six months within the Organization of the Petroleum Exporting Countries (OPEC) and additional pledges by some key non-OPEC producers put upward pressure on prices at the end of 2016 as markets appear to be anticipating tighter balances than previously forecast. 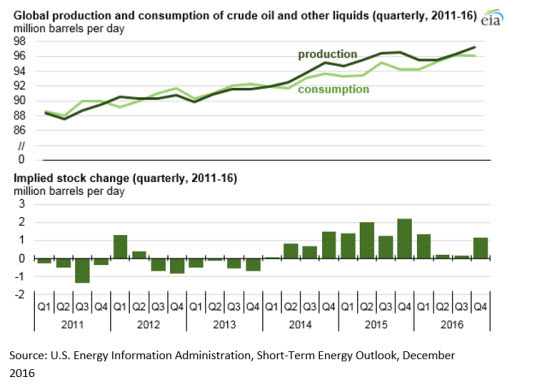 U.S. crude oil production was lower in 2016 than in 2015 by more than 500,000 barrels per day (b/d) using estimates from the December Short-Term Energy Outlook (STEO). The decrease was driven by reductions in Lower 48 onshore production, with an estimated decline in production from 2015 to 2016 of nearly 700,000 b/d. Despite the decline, production of crude oil is forecast to average 8.9 million b/d in 2016, the second highest level since 1985. The Brent-WTI price spread averaged less than $1/b in 2016, significantly below the 2015 average spread of $3.45/b. Based on data through September 2016, average U.S. imports of crude oil increased by more than 500,000 b/d from 2015 to 7.9 million b/d, the highest level since 2012. The United States imported the three largest volumes of crude oil from Canada, Saudi Arabia, and Venezuela. The number of countries receiving U.S. crude oil exports has risen since restrictions on exporting U.S. crude oil were lifted in December 2015. Despite declines in domestic production, total crude oil exports for 2016 were up, with estimates through October 2016 totaling more than 500,000 b/d, an increase of more than 30,000 b/d from the same period in 2015. EIA estimates that total OPEC crude oil and other liquids production increased 3% to 39.3 million b/d in 2016. At the November 30 OPEC meeting, member countries agreed to reduce production by approximately 1.2 million b/d from an October baseline to lower OPEC’s production ceiling to 32.5 million b/d beginning January 1, 2017. Non-OPEC countries met following OPEC’s agreement and agreed to cut production by 558,000 b/d, with Russia making the largest cuts of approximately 300,000 b/d.